Heat jaggery in a pan with ½ cup of water .Switch off the flame once slight honey like consistency is reached. Measure and take the rice in a pressure cooker. Wash the rice well and add 1 cup of water. Pressure cook it for 3 whistles in medium flame. Open the cooker and fluff the rice with a fork once pressure released. Then Strain the jaggery water on the cooked rice using a strainer to remove impurities. Now heat the pressure cooker in low medium flame until the jaggery syrup is absorbed by the rice. Once the jaggery syrup and rice combined well, add grated coconut, cardamom powder and dry ginger powder. Mix well. Cook it further for 2 minutes. Then add in 2 tbsp of ghee, raisins and broken cashews. Mix everything together. Switch off the flame once done. 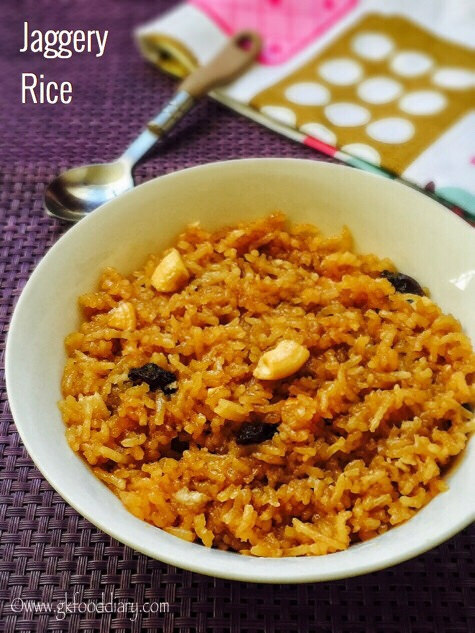 Serve the jaggery rice warm.